Its the last day of the first month of the year and I can't believe how fast it went. 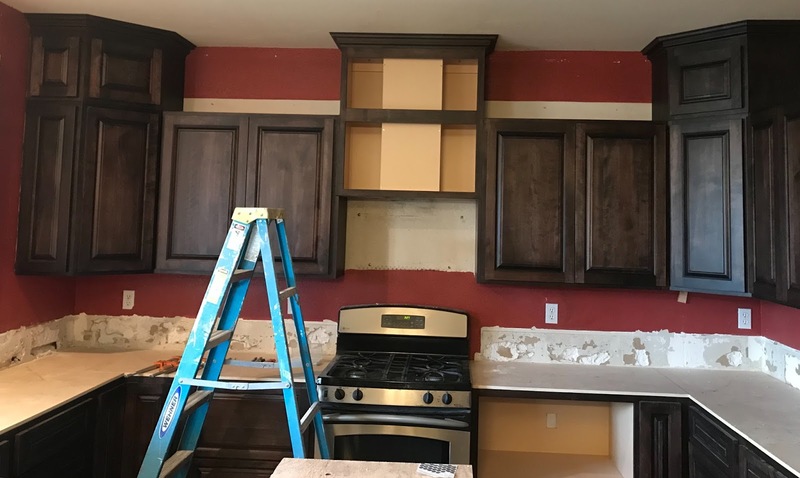 We were working on two different kitchens and one was put in the second week of January and the other was put in last week. 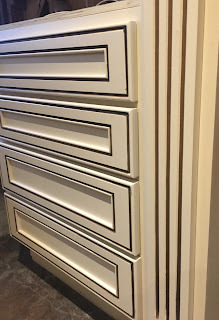 The first one was painted cabinets with a glaze in the routing. 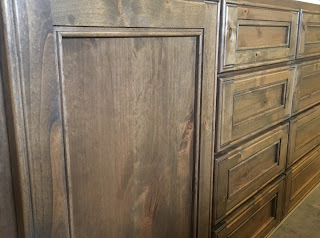 We made the doors a style with grooves in order to have a place for the brown glaze. I did have fun using a tiny brush to put the glaze in! All the photos are close up because the counters, flooring, and appliances are not in yet. 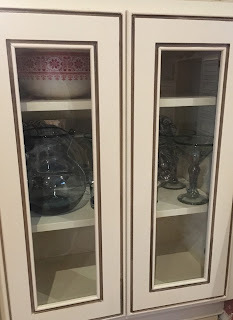 I wanted to make sure that the glazing was also able to be in the frames of the cabinets in various areas so I put fluting in when I could. 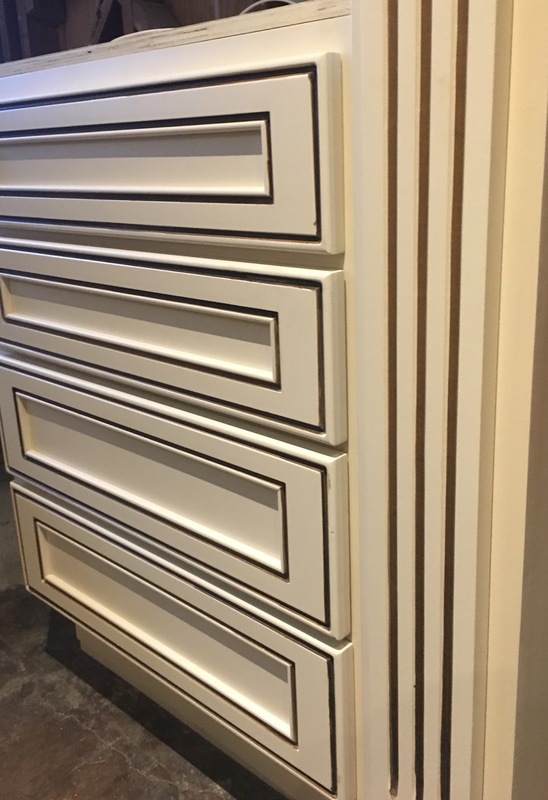 That is the three grooves on the right side of the drawer fronts in the pictures. 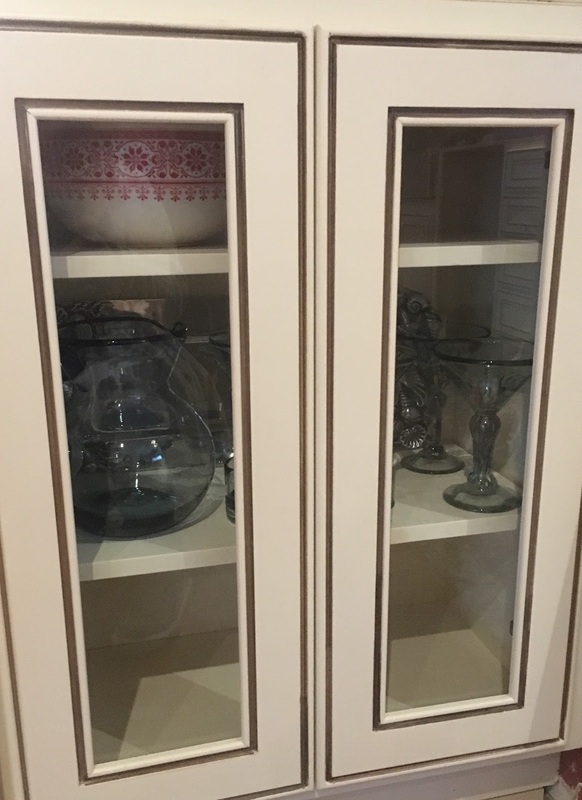 It gives the cabinet an extra something! The island was special too! 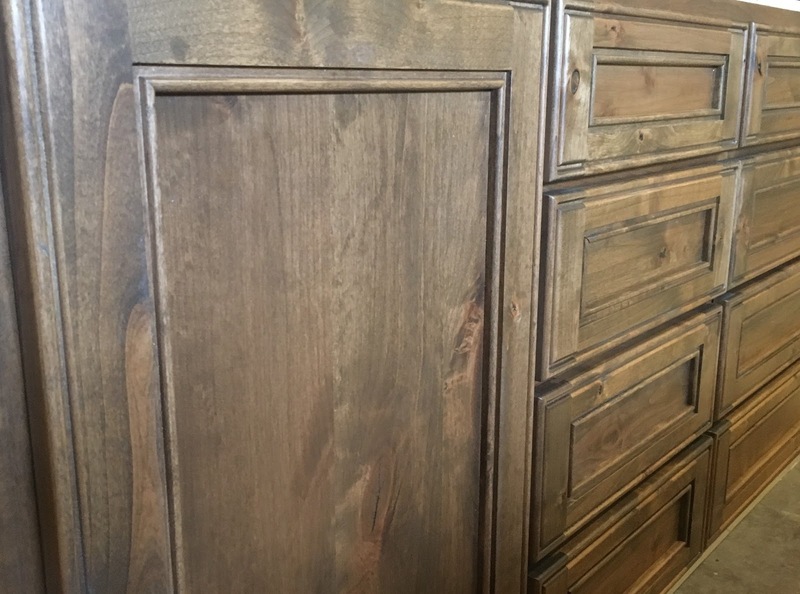 It was made with Knotty Alder and stained a light brown. 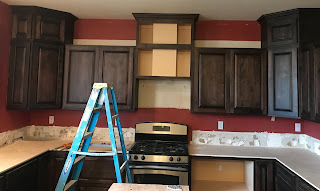 Next I have the second kitchen which is not all the way done....just the cabinets are in. This kitchen was made with natural birch lumber and stained a brown espresso. I just love it! This is the cabinet where the refrigerator will be going. 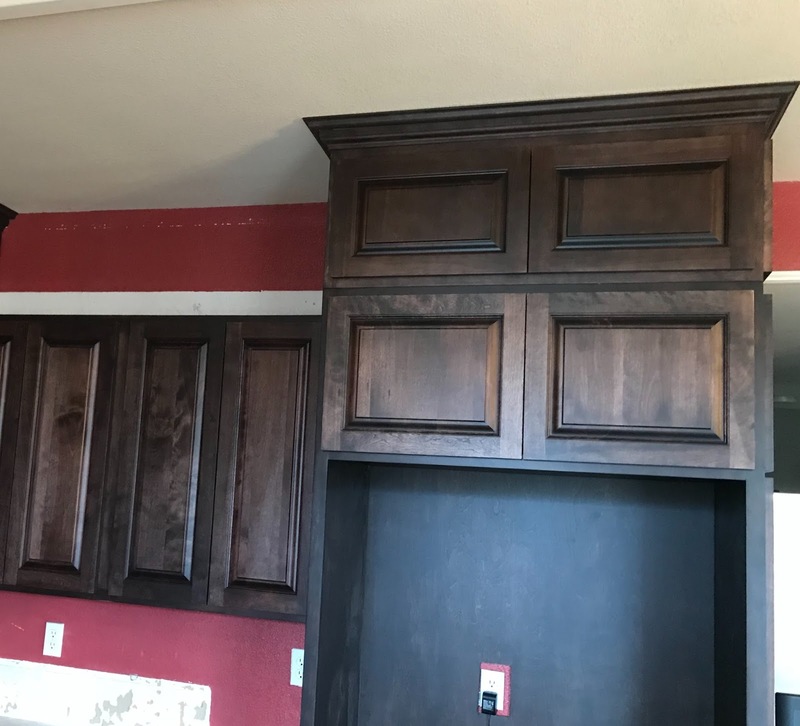 I did a variance of heights on the upper cabinets to give the room some dynamics. I can't wait till all these are complete....and I will be able to get final photos. Both Kitchens are in Lodi, California and I loved working with both families. It was my pleasure. *Update on my last post about the "big" job I have been waiting on an official answer to. I was told that they decided to use another vendor. They said they would keep me close in case this vendor doesn't do well.......well if you know me you know what I was thinking. Um. No. Please don't bother keeping me waiting in the wings.....I will fly on to other green pastures. But, now that its been a few days I am better and more rational and I believe what I have said all along, "If God wants me to have the job, I will have the job. He knows what's best and what I need." Do you ever wonder if what you are doing is in God's will? Do you ever worry that you are not doing what you're supposed to do? After all the worrying i decided to go on Twitter and saw this great quote from Gianna Jessen: "God is holding on to you. Tell him what's in your Heart. It matters to him." I realized that Yes! God does want to hear about my cabinet woes, yes he wants me to put him first and trust him completely, and yes he thinks i matter. That was the big one, I matter. It makes me emotional every time i hear it because sometimes you just don't feel like you matter and what you're doing is not that important. It made me realize that God is in control, if he wants me to have the job i will. He knows what's best. Well didn't that just answer my question. As long as I am doing everything for God's glory i am in his will. I am super excited about that, and i am grateful for the opportunity he has given me. And i think this year is going to be the BEST.EVER. Not kidding, i really want a hot fudge sundae, maybe i will get one....for dinner. I am hoping i will have an answer today or tomorrow and if that's the case i will be blogging again to give all the details of this new job and what it entails cause seriously its the BIG ONE. Not to get over excited or anything. So now that i got my wondering under control and i got all this off my chest i can go on to other things......like following up or what Mr. Know-it-All calls "being a pest."